If you’re new to gold investing you may be wondering what factors influence the gold price today. Here’s a quick look. Gold is the best-known and most popular precious metal, and it’s not hard to see why. Beyond being a key material for jewelry, investors around the world use the yellow metal as a store of wealth, and many believe it’s superior to any and all paper currencies. Storing wealth with a sense of stability is a popular reason for gold investing. Yet despite its popularity, the gold price is currently languishing well below its 2011 peak of nearly $1,900 per ounce. It took a steep dive midway through 2013, slipping to about $1,220; it then remained between $1,100 and $1,300 for much of 2014 and 2015. Since then it’s staged a bit of a recovery, rising above $1,300 in 2016. In 2017, however, the gold price stayed below $1,300 with the exception of brief increases midway through and late in the year. So far 2018 has been a mixed bag for the yellow metal — while it was able to stay above $1,300 for much of the first half of the year it has since sunk to nearly $1,200. The below chart from Kitco provides a good outline of gold’s price activity since the start of 2010. Data covers the period between January 1, 2010 and July 31, 2018. When the gold price began to fall in 2013, market watchers expected some mine production to come off the market; however, most gold producers opted to lower salaries and cut employees rather than reduce their output. Many producing gold companies also chose to reduce exploration in order to keep their existing operations afloat. In 2016, the tide began to turn for gold investing. As mentioned, the gold price recovered somewhat that year, even rising above $1,300. However, times were still tough for exploration — in fact, even two years later the consensus is that not enough money is being spent on finding new gold deposits. Even so, gold mine production was flat from 2016 to 2017 at 3,268 tonnes, and is expected to grow this year. Most gold is produced in China, with Australia and Russia being the second and third top producers. Respectively, they put out 300 MT, 270 MT and 255 MT of the yellow metal in 2017. Looking at consumption, gold demand fell 7 percent year-on-year in 2017 to a total of 4,308.7 tonnes. ETF inflows were less than the previous year, and bar and coin demand fell as well, although just by 2 percent. China and India are major consumers of physical gold, and the title of world’s largest gold consumer is often a toss up between the two. As a side note on supply and demand, investors should be aware that most of the gold ever mined still exists and is accessible — for example, as jewelry or bullion. In contrast, many other metals come off the market when they are used. That means that the gold space is also affected by saving and disposal tactics, and not just by simple supply and demand. While supply and demand are key factors in the gold market, it’s important for investors entering and operating in the space to be aware that they’re not the only things that can have an impact on the metal. In particular, global economics can have a drastic effect on gold. Put simply, gold earns no interest, and thus tends to fare better when interest rates are lower; conversely, when interest rates are higher, it becomes less desirable as an investment. Interestingly, that relationship has been less visible in recent years. In March, the US Federal Reserve raised interest rates for the sixth time in three years, and rather than sinking the gold price increased. Experts have suggested that the reason the hike did not result in a gold price decline is that it was already “baked into” the market — in other words, traders had been anticipating an increase. Gold investing is also often favored by investors as a safe haven in times of economic and political turmoil. There are countless instances of people flocking to gold investing in times of uncertainty — for example, gold and gold stocks got a bump after US President Donald Trump canceled a meeting with the leader of North Korea, and again when Trump told Russia to “get ready” for US missiles fired at Syria. Price manipulation is also a concern in the gold space, but luckily it’s one that the world’s gold market participants are keen to address. Indeed, early in 2015, the long-running London gold fix was replaced by the LBMA gold price in a bid to increase gold price transparency. Though the process still involves a variety of banks collaborating to set the gold price, the system is now electronic. While the gold price may be lower than investors would like, it’s clear that interest in the metal remains strong around the world. Those keen on gold investing would do well to remember that like most markets, the gold sector is cyclical, meaning that what goes down must eventually rise again — although by how much is anyone’s guess. Our 2018 gold price outlook includes a more detailed view of the future for gold and gold investing— take a read here. 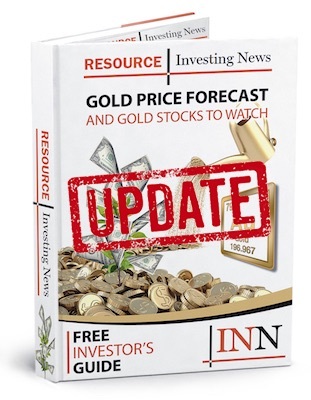 You can also check out our latest quarterly update on gold by clicking here. Are you interested in gold investing? Do you believe that the gold price will rise to its 2011 levels?